Paul Spagnuolo, a world leader in neutraceutical research and his discovery of an avocado-based lipid that attacks leukaemia stem cells are the winners of LIST’s first International Award in Bioinnovation (LIAB Award 2017). On Thursday, 23rd November 2017, about 120 guests assisted a night of research celebration at the LIAB Award, including the newly elected Mayor of Esch-sur-Alzette, Georges Mischo, representatives from the Ministry of Research and Higher Education, the Ministry of Economy and the Ministry of Health, as well as colleagues from the University of Luxembourg and Luxembourg’s other research institutions. During the ceremony, the work of Dr Paul Spagnuolo, who runs a unique laboratory positioned amongst the world leaders in food, nutrition and nutraceutical research at the University of Guelph in Ontario, Canada, was rewarded with the first LIAB Award, receiving a check of 10,000 euros, courtesy of PM-International. In his in-depth presentation, Paul Spagnuolo demonstrated his latest discoveries, on how Avocatin B, a lipid contained in the avocado, showed impressive positive effects in the treatment of leukaemia patients. In particular, he highlighted the cell and molecular mechanisms by which Avocatin B selectively targets and eliminates leukaemia stem cells. Through the LIAB Award and its over 30 candidates from more than 16 countries, the Luxembourg Institute of Science and Technology (LIST) and its partner PM-International have succeeded in connecting Luxembourg to some of the best researchers in the field of bioinnovation. Cell biology is a central theme in Luxembourg’s research landscape and a great amount of innovative applications are currently made possible through the identification and extraction of molecules, spanning fields such as medicine, agriculture, greentech, cosmetics, circular economy and so on. Exemplified by Paul Spagnuolo’s work, the LIAB award rewards research findings and technologies that are particularly likely to be transferred to the market. The award takes a deep look into natural objects found in our environment, like a plant, or an avocado (which is a fruit, not a vegetable!). This type of research is carried out at LIST as part of its environmental activities. In its laboratories, LIST’s interests include the molecular composition of plants in order to discover specific molecules with specific properties. A research team is also devoted to exploiting natural biological raw materials and try not only to elucidate underlying mechanisms of plant cell wall biopolymer formation and deconstruction but also to valorize plant biomass as a source for bioenergy and biopolymers for innovative and commercially interesting applications. The LIAB Award is sponsored by PM-International, a Luxembourg-based nutrition company specialized in premium dietary supplements and health products. This collaboration is in no way coincidental. LIST and PM-International have been working together on innovative bioactive molecules for dietary supplements and cosmetics for about a year. Shared laboratories between the two partners have been set-up in LIST’s main laboratory building in Belvaux. This joint infrastructure facilitates operations and investments in the extraction and transformation of plant-derived molecules. Thanks to this type of research based on close collaboration with industrial partners, LIST meets the concrete needs of the market. 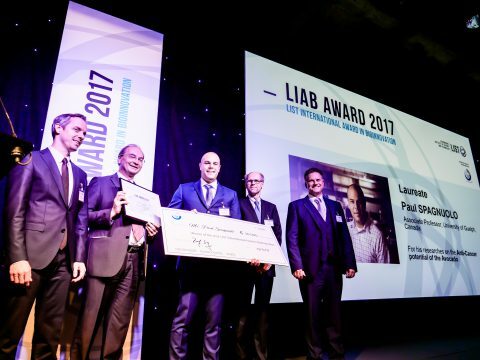 The LIAB Award 2017 is also highly symbolic for the Research and Innovation Campus of Esch-Belval that unites many of Luxembourg’s public research players, such as the Universtiy, FNR, LIH, LISER as well as its partners from Luxinnovation and Technoport. Thanks to this spotlight, the Mayor of Esch-sur-Alzette highlighted the importance of innovation and research as a great asset in view of 2022, when the City of Esch-sur-Alzette will be the European Capital of Culture.